MSNBC's Alex Wagner and the NOW panel talk with CNBC's Andrew Ross Sorkin about the financial impact of Sandy, and the potential billions of dollars caused by the storm's damage. Updated at 6:10 p.m. ET: The economic hit from Superstorm Sandy may have a big silver lining. The ferocious hurricane that swamped New York City will almost certainly turn out to be one of the costliest storms on record. Given the scope and severity of the damage, it's difficult to guess the costs from the fires, floods, wind and rain, but initial estimates of $30 billion to $50 billion may turn out to be too low. By comparison, the most expensive U.S. storm so far, 2005's Hurricane Katrina, caused about $46.6 billion in damages. The massive scope of the storm -- at more than 900 miles across, Sandy was the largest tropical system ever recorded in the Atlantic Ocean -- helps explain why the damage was so widespread. Slamming ashore in the most heavily populated region of the country, where 10 states have declared a state of emergency, means the storm could leave a measurable hole in this quarter's growth, economist say. Insured losses alone will run from $7 billion to $15 billion, according to an estimate published late Tuesday by AIR Worldwide, a catastrophe modeling firm. That does not include uninsured propertie and publicly owned infrastructure such as roads and bridges. "The effect on growth for the fourth quarter will not be catastrophic but might still be noticeable, especially in an economy with little momentum anyway," said IHS Global economists Gregory Daco and Nigel Gault in a research note. But the economic hit in the short run will be heavily offset by the boost in spending and hiring that will accompany cleanup and rebuilding efforts in the weeks and months ahead. A full accounting will include not only property damage but business activity lost to closed factories and offices, along with widespread outages and shutdowns of transportation, telecommunications and power networks. In an age when telecommuting helps offset weather-related business interruptions, Sandy threw a major monkey wrench into the work lives of tens of millions of people. More than 8 million customers were without power Tuesday in the greater New York area alone. Ashworth figures that the 12 states in Sandy’s path account for about 23 percent of national gross domestic product, which works out to about $13 trillion a day in economic output. That means the upcoming weekly and monthly economic data -- from retail sales to jobless claims -- likely will include asterisks with Sandy’s name attached. Some of that lost business, from late Halloween retail sales to more than 14,000 canceled airline flights, will never be recovered. Other consumer and business spending is simply shifted around the storm. After a surge of sales over the weekend as customers stocked up, home centers, gas stations and supermarkets were closed (or all but empty if open) as customers stayed home on Monday and Tuesday. But they will soon need to stock up again on food, fuel, cleaning materials and other items to help them repair their homes. “When we look at snowstorms and tornado events and hurricane events like this, typically it generally smooths out to be a pretty normal 10 or 15 days once the event plays out,” said Michael Schlotman, CFO of the Kroger supermarket chain. The region’s overall economy will likely see a similar smoothing out as the cost of losses from physical damage and business interruption are offset by the upcoming flood of payments from insurance claims. Only a portion of Sandy-related losses will be covered. Some businesses and households may never recover their losses. Others will be long-term winners, using claim payouts to rebuild and make improvements. But the process will inject tens of billions of dollars, money that otherwise would not have been spent, into the regional economy. The increased spending will produce ripple effects for companies supplying the products and services needed to repair the damage, from construction firms to car dealers. The money to pay for all this will be drawn from the roughly $500 billion in capital accumulated by the global insurance industry through premiums collected in years past. 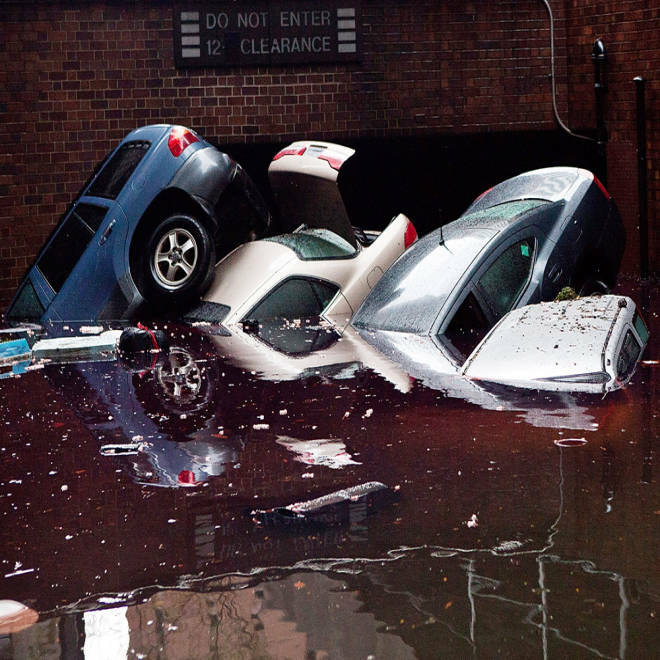 Some insurers may take a hit on their earnings from payouts, and the cost will ultimately be made up with future premiums, which may rise to cover Sandy-related claims. Much of the burden will eventually fall to the large global reinsurers, the companies that insure insurers, most of which are based in Europe. But as the money flows into the regional economy, it will create a significant economic stimulus. “The upshot is that, when we consider the cleanup activity, the overall impact on GDP growth could even be positive,” said Ashworth. Video: Storm insurance: Is your home covered?